DESCRIPTION: Approximately 10 - 15mm. 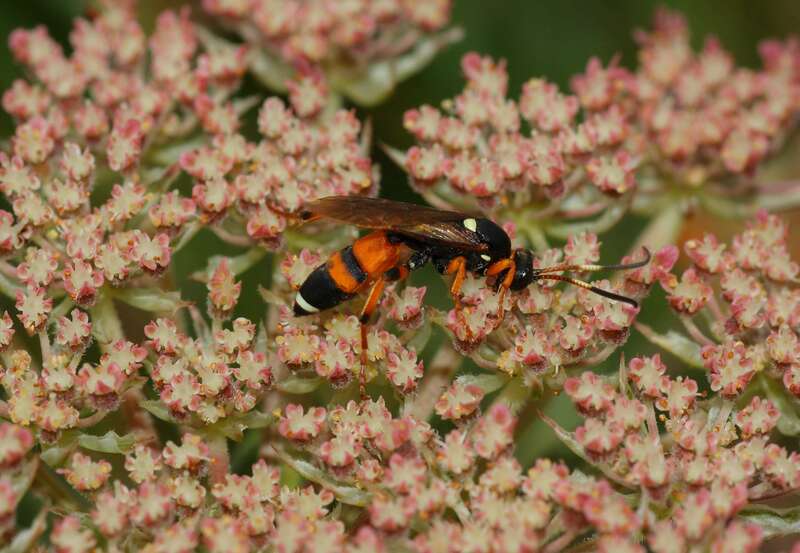 A frequent visitor of flowerheads the females of this striking wasp are readily identified by the orange banding on the legs and abdomen, the cream band at the latter end of the abdomen, the cream semi-circle at the base of the thorax and the tri-coloured antennae. Males have yellow and black banding on the legs and abdomen. BEHAVIOUR: Usually found singly on umbellifer flowerheads. The food of the larvae comprises of various noctuid caterpillars. DISTRIBUTION: Frequent throughout. HABITAT: Open meadows, hedgerows and coastal flowery areas. PERIOD: May to October.